Participating in class is a great opportunity to connect with your members on a peer level (as opposed to the normal student/teacher dynamic.) Sharing a bar during squats or racing to the finish during Helen can help draw you and your members closer. You will find yourself interacting and getting in conversations with members in a way you wouldn’t during a normal group class that you are running. Culture can be a hard thing to teach in the gym. In the early days, it was pretty easy since the CrossFit community was relatively small, but those days are behind us. Most gyms now have tons of new folks coming in with widely different levels of cultural understanding about CrossFit and it can be tricky to get people up to speed. An easy way to do this is by acting as a model member when you take classes. Having your equipment prepped, being a good barbell partner, cheering members on as they finish a workout- a lot of those things are not intrinsically understood by people. By taking class, you can model the behavior you want your members to exhibit. Finally, taking group class is a great way to do a little extra auditing of your coaches and programming (whether you do it yourself or another coach handles it). Participating in a class gives you a ground level view of things and really lets you understand how a class or workout “feels” beyond how it just looks from afar or on paper. Plus, you get some fitness out of it! In sum, while there are definitely reasons for you or your coaches to “follow your own path,” I’d encourage to set a goal for everyone to take at least one group class a week. 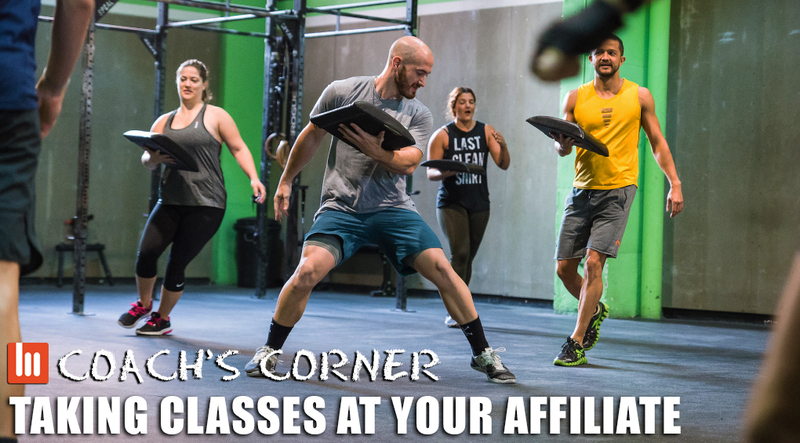 Taking classes at your affiliate can connect you more deeply to your members, prove you “practice what you preach,” and give you a deeper understanding of how things are working at your gym.